This article is about the king. For Thai crowns, see Chada and mongkut. Not to be confused with Vajiravudh (reigning title Phra Mongkut Klao Chaoyuhua). Mongkut, also known as King Rama IV, reigning title Phra Chom Klao Chao Yu Hua[a] (18 October 1804 – 1 October 1868), was the fourth monarch of Siam (Thailand) under the House of Chakri, ruling from 1851 to 1868. Outside Thailand, he is best known as the king in the 1951 musical and 1956 film The King and I, based on the 1946 film Anna and the King of Siam – in turn based on a 1944 novel by an American missionary about Anna Leonowens' years at his court, from 1862 to 1867. During his reign, the pressure of Western expansionism was felt for the first time in Siam. Mongkut embraced Western innovations and initiated the modernization of his country, both in technology and culture—earning him the nickname "The Father of Science and Technology" in Siam. 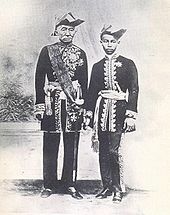 Mongkut was also known for his appointing his brother, Prince Chutamani, as Second King, crowned in 1851 as King Pinklao. Mongkut himself assured the country that Pinklao should be respected with equal honor to himself (as King Naresuan had done with his brother Ekathotsarot in 1583). Mongkut's reign was also the time when the power of the House of Bunnag reached its zenith and became the most powerful noble family of Siam. From 1824 – 1851 Prince Mongkut spent his life as a monk. In 1824, Mongkut became a Buddhist monk (ordination name Vajirayan; Pali Vajirañāṇo), following a Siamese tradition that men aged 20 should become monks for a time. The same year, his father died. By tradition, Mongkut should have been crowned the next king, but the nobility instead chose the older, more influential and experienced Prince Jessadabodindra (Nangklao), son of a royal concubine rather than a queen. 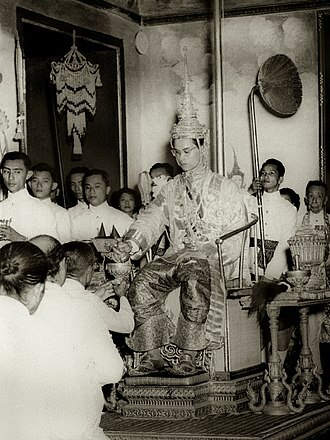 Perceiving the throne was irredeemable and to avoid political intrigues, Mongkut retained his monastic status. Vajirayan became one of the members of the royal family who devoted his life to religion. 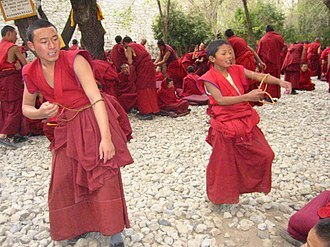 He travelled around the country as a monk and saw the relaxation of the rules of Pali Canon among the Siamese monks he met, which he considered inappropriate. In 1829, at Phetchaburi, he met a monk named Buddhawangso, who strictly followed the monastic rules of discipline, the vinaya. 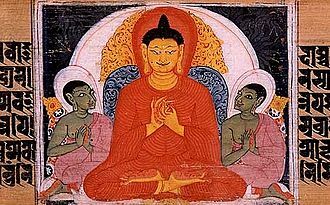 Vajirayan admired Buddhawangso for his obedience to the vinaya, and was inspired to pursue religious reforms. In 1833 he began a reform movement reinforcing the vinaya law that evolved into the Dhammayuttika Nikaya, or Thammayut sect. A strong theme in Mongkut's movement was that, "…true Buddhism was supposed to refrain from worldly matters and confine itself to spiritual and moral affairs." Mongkut eventually came to power in 1851, as did his colleagues who had the same progressive mission. From that point on, Siam more quickly embraced modernization. Vajirayan initiated two major revolutionary changes. Firstly, he fought for the people to embrace modern geography, among other sciences considered "Western." 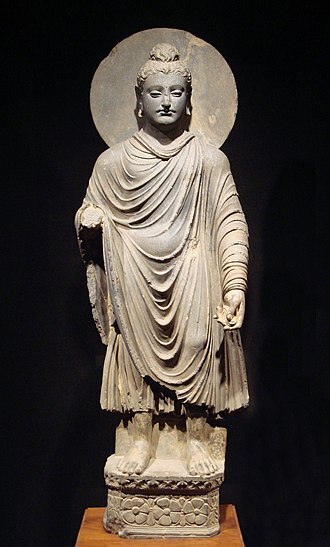 Secondly he sought reform in Buddhism and, as a result, a new sect was created in Siamese Theravada Buddhism. Both revolutions challenged the purity and validity of the Buddhist order as it was practiced in Siam at the time. 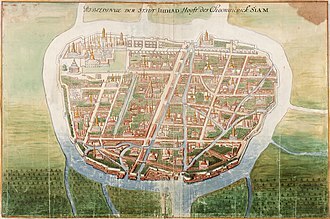 In 1836, Vajirayan arrived at Wat Bowonniwet in what is now Bangkok's central district, but was then the city proper, and became the wat's first abbot (เจ้าอาวาส). 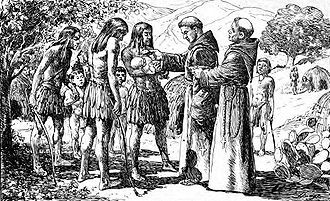 During this time, he pursued a Western education, studying Latin, English, and astronomy with missionaries and sailors. Vicar Pallegoix of the Roman Catholic Archdiocese of Bangkok lived nearby; the two became close friends, and Vajirayan invited Pallegoix to preach Christian sermons in the wat. Vajirayan admired Christian morals and achievements as presented by the vicar, but could make nothing of Christian doctrine. It was then he made the comment later attributed to him as king: "What you teach people to do is admirable, but what you teach them to believe is foolish." King Mongkut would later be noted for his excellent command of English, although it is said that his younger brother, Vice-King Pinklao, could speak it even better. 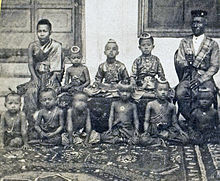 Mongkut's first son and heir, Chulalongkorn, granted the Thammayut sect royal recognition in 1902 through the Ecclesiastical Polity Act; it became one of the two major Buddhist denominations in modern Thailand. 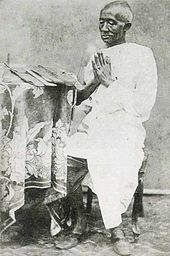 Chulalongkorn also persuaded his father's 47th child, Vajirañana, to enter the order and he rose to become the 10th Supreme Patriarch of Thailand from 1910 to 1921. Accounts vary about Nangklao's intentions regarding the succession. It is recorded that Nangklao verbally dismissed the royal princes from succession for various reasons; Prince Mongkut was dismissed for encouraging monks to dress in the Mon style. Some[who?] said, however, that Nangklao wished his throne to be passed to his son, Prince Annop, and that he gave his bracelet which had been passed down from Phutthayotfa Chulalok to the prince. However, Dis Bunnak switched the bracelet for a forged one, thus preventing Annop from inheriting the throne. Prince Mongkut was indeed supported by the pro-British Dis Bunnak who was the Samuha Kalahom, or Armed Force Department's president, and the most powerful noble during the reign of Rama III. He also had the support of British merchants who feared the growing anti-Western sentiment of the previous reign and saw the 'prince monk' Mongkut as the 'champion' of European civilization among the royal elite. Bunnak, with the supporting promise of British agents, sent his men to the leaving-from-monk-status ceremony for Prince Mongkut even before Nangklao's death. With the support of powerful nobility and the Great Power, Britain, Mongkut's ascension to the throne was ensured. After his twenty-seven years of monastic life, King Mongkut voluntarily defrocked and ascended the throne in 1851, aged 47. He took the name Phra Chom Klao, although foreigners continued to call him King Mongkut. The king was well known among the foreigners, particularly some British officers, as pro-British. Sir James Brooke, a British delegation, even praised him as 'our own king', and showed his support of him as a new king of Siam. Having been celibate for 27 years, he now set about building the biggest Royal Family of the Chakri Dynasty. In the "Inside" of the Palace there was a veritable city of women—reports say three thousand or more. They were mostly servants, Amazons for guards, officials, maids and so on, but Mongkut acquired 32 wives, and by the time he died, aged 64, he had 82 children. His awareness of the threat from the British and French imperial powers, led him to institute many innovative activities. He ordered the nobility to wear shirts while attending his court; this was to show that Siam was no longer barbaric from the Western point of view. However, Mongkut's own astrological calculations pointed out that his brother, Prince Isaret, was as well favoured as himself to be the monarch. So, Mongkut then crowned his brother as King Pinklao, the second king. As a prince, Pinklao was known for his abilities in foreign languages and relations. Mongkut also raised his supporter Dis Bunnak to Somdet Chao Phraya Borom Maha Prayurawongse (Somdet Chao Phraya was the highest rank of nobility on a par with royalty) and made him his regent kingdom-wide. Mongkut also appointed Dis Bunnak's brother, Tat Bunnak, as Somdet Chao Phraya Borom Maha Pichaiyat, as his regent in Bangkok. As the result, the administrative power of Siam rested largely in the hands of the two Bunnaks, Dis and Tat. Upon his coronation, Mongkut married his first wife, Queen Somanat. However, Queen Somanat died in the same year. He then married his half-grandniece, Mom Chao Rampoei Siriwongse, later Queen Debsirindra. In 1849, there were upheavals in the Shan State of Kengtung and Chiang Hung kingdom in response to weakened Burmese influence. However, the two states then fought each other and Chiang Hung sought Siamese support. Nangklao saw this as an opportunity to gain control over Shan states but he died in 1851 before this plan was realized. In 1852, Chiang Hung submitted the request again. 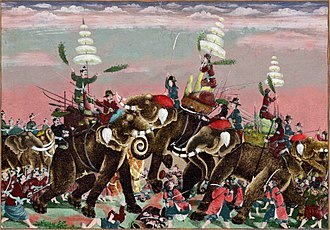 Mongkut sent Siamese troops northwards but the armies were turned aside by the mountainous highlands. In 1855 the Siamese marched again and reached Kengtung – though with even greater difficulty. They laid siege on Kengtung for 21 days. However, the resources of the Siamese army ran out and the army had to retreat. Accompanying the influx of Western visitors to Siam was the notion of a round earth. By many Siamese, this was difficult to accept, particularly by religious standards, because Buddhist scripture described the earth as being flat. The Traiphum, which was a geo-astrological map created before the arrival of Westerners, described "…a path between two mountain ranges through which the stars, planets, moon and sun pass." Religious scholars usually concluded that Buddhist scriptures "…were meant to be taken literally only when it came to matters of spiritual truth; details of natural science are revealed figuratively and allegorically." Mongkut claimed to have abandoned the Traiphum cosmology before 1836. He claimed that he already knew of the round state of earth 15 years before the arrival of American missionaries, but the debate about Earth's shape remained an issue for Siamese intellectuals throughout the 1800s. During his reign, Mongkut urged his royal relatives to have "a European-style education." The missionaries, as teachers, taught modern geography and astronomy, among other subjects. Six years after Mongkut's death, the first Thai-language geography book was published in 1874, called Phumanithet by J.W. Van Dyke. However, geography was only taught in select schools, mainly those that were run by American missionaries with English programs for upper secondary students. Thongchai Winichakul argues that Mongkut's efforts to popularize Western geography helped bring reform to education in Siam. Chuang Bunnag served as King Mongkut's chief minister for all of his reign, and later served as regent for his son Chulalongkorn. 1852 saw an influx of English and American missionaries into Siam as Mongkut hired them to teach the English language to the princes. He also hired Western mercenaries to train Siamese troops in Western style. In Bangkok, American Dan Beach Bradley had already reformed the printing and then resumed the publishing of Siam's first newspaper, the Bangkok Recorder. However, the missionaries were not as successful when it came to making religious conversions. However, Mongkut did not abandon the traditional culture of Siam. In 1852, he ordered the nobles of the court to wear upper garments. Previously, Siamese nobles were forbidden to wear any shirts to prevent them from hiding any weapons in it and met the king bare-chested. The practice was criticized by Westerners and so Mongkut ended it. For Buddhism, Mongkut pioneered the rehabilitation of various temples. He also began the Magha Puja (มาฆบูชา) festival in the full moon of the third lunar month, to celebrate Buddha's announcement of his main principles. He instigated the Recompilation of Tripitaka in Siam according to Theravada traditions. He also formally established the Thammayut sect as a rightful branch of Theravada. Mongkut also improved women's rights in Siam. He released a large number of royal concubines to find their own husbands, in contrast to how his story has been dramatized. He banned forced marriages of all kinds and the selling of one's wife to pay off a debt. In contrast to the previous king, Nangklao, Mongkut didn't see the importance of sending envoys to the Qing dynasty court, as the mission symbolised Siam's subjection to the Qing emperors and because the Qing dynasty was then not so powerful as it had once been, as it was itself threatened by Western powers. In 1854, John Bowring, the Governor of Hong Kong in the name of Queen Victoria, came to Siam to negotiate a treaty. For the first time Siam had to deal seriously with international laws. Prayurawongse negotiated on the behalf of the Siamese. The result was the Bowring Treaty, which was regarded as an unequal treaty imposed by the British Empire on Siam. The main principle of the treaty was to abolish the Royal Storage (พระคลังสินค้า), which since Ayutthaya's times held the monopoly on foreign trade. The Royal Storage had been the source of Ayutthaya's prosperity as it collected immense taxation on foreign traders, including the taxation according to the width of the galleon and the tithe. Western products had to go through a series of tax barriers to reach Siamese people. The Europeans had been attempting to undo this monopoly for a long time but no serious measures had been taken. For Siamese people, trading with foreigners subjected them to severe punishment. The taxation was partially reduced in the Burney Treaty. However, in the world of liberalism of the nineteenth century, such unequal and government-interfered trade was disappearing. The abolition of such trade barriers replaced Siamese commerce with free trade. Import taxation was reduced to 3% and could only be collected once. This, of course, was a blow on the national revenue. However, this led to dramatic growth of commercial sectors as common people gained access to foreign trade. People rushed to acquire vast, previously empty fields to grow rice and the competition eventually resulted in the lands ending up in the hands of nobility. The Bowring Treaty also had a legal impact. Due to the horror of the Nakorn Bala methods of torture in judicial proceedings, the British chose not to be tried under the Siamese system, securing a grant of extraterritoriality; British subjects in Siam were therefore subject only to British law, while the Siamese in Britain enjoyed no reciprocal privilege. In 1856, with the skilled assistance of the French diplomat Albert-Édouard Levieux de Caligny to the court of King Mongkut and the envoy of Charles de Montigny, more treaties were then made with other powers, further undermining national revenue and legal rights. The Bowring treaty proved to be the economic and social revolution of Siam. Mongkut's reign saw immense commercial activities in Siam for the first time, which led to the introduction of coinage in 1860. The first industries in Siam were rice milling and sugar production. Infrastructure was improved; there was a great deal of paving of roads and canal digging – for transport and water reservoirs for plantations. Anna Leonowens was born in 1831, she worked for King Mongkut from 1862 to 1867. 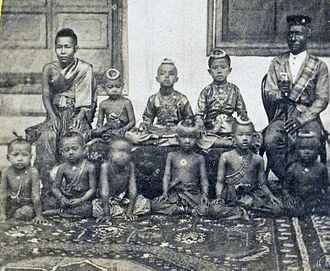 King Mongkut of Siam (far right), with Queen Debsirindra and some of his children. King Mongkut had 82 children. 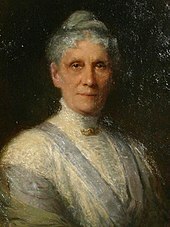 In 1862, following a recommendation by Tan Kim Ching in Singapore, the court hired an English woman named Anna Leonowens, whose influence was later the subject of great Thai controversy. It is still debated how much this affected the worldview of one of his sons, Prince Chulalongkorn, who succeeded to the throne. 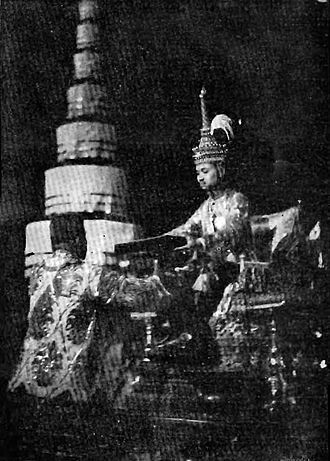 Her story would become the inspiration for the Hollywood movies Anna and the King of Siam and Anna and the King and the Rodgers and Hammerstein musical The King and I, which, because of their fictionalized historical references and perceived disrespectful treatment of King Mongkut, were initially banned in Thailand as the Thai government and people considered them to be lèse majesté. To clarify the historical record, well-known Thai intellectuals Seni and Kukrit Pramoj in 1948 wrote The King of Siam Speaks. The Pramoj brothers sent their manuscript to the American politician and diplomat Abbot Low Moffat (1901–1996), who drew on it for his 1961 biography, Mongkut the King of Siam. Moffat donated the Pramoj manuscript to the United States Library of Congress in 1961. Anna claimed that her conversations with Prince Chulalongkorn about human freedom, and her relating to him the story of Uncle Tom's Cabin, became the inspiration for his abolition of slavery almost 40 years later. However, the slavery system in Siam differed from that in the United States with no racial distinction between slaves and free persons. Slavery in Thailand was sometimes a voluntary alternative for individuals to be rid of social and financial obligations. One could be punished for torturing slaves in Siam and some slaves could buy their freedom. Some western scholars and observers have expressed the opinion that Siamese slaves were treated better than English servants. During his monkhood, Mongkut studied both indigenous astrology and English texts on Western astronomy and mathematics, hence developing his skills in astronomical measurement. One way that he honed his mastery of astronomy, aside from the accurate prediction of the solar eclipse of August 18, 1868 (Wakor solar eclipse), was changing the official Buddhist calendar, "which was seriously miscalculated and the times for auspicious moments were incorrect." 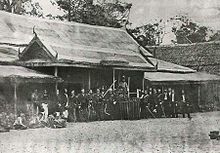 In 1868, he invited high-ranking European and Siamese officials to accompany him to Wakor village in Prachuap Khiri Khan Province, south of Hua Hin, where the solar eclipse that was to occur on 18 August could be best viewed as a total eclipse. Sir Harry Ord, the British Governor of Straits Settlements from Singapore, was among those who were invited. King Mongkut predicted the solar eclipse, at (in his own words) "East Greenwich longitude 99 degrees 42' and latitude North 11 degrees 39'." King Mongkut's calculations proved accurate. When he made calculations on the Wakor solar eclipse that was to occur, he used the Thai system of measuring time ("mong" and "baht"), but he implemented the Western method of longitude and latitude when he determined where on earth the eclipse would best be viewed. Upon returning from his journey to Wakor, he condemned the court astrologers "for their...stupid statements because of their negligence of his detailed prediction and their inattention to measurement and calculation by modern instruments." During the expedition, King Mongkut and Prince Chulalongkorn were infected with malaria. 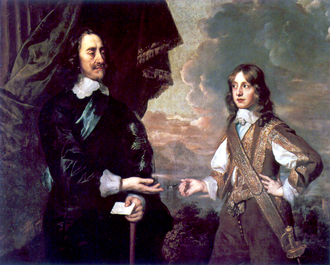 The king died six weeks later in the capital, and was succeeded by his son, who survived malaria. It has been argued that the assimilation of Western geography and astronomy into 19th-century Siam "proved that Siam equalled the West in terms of knowledge, and therefore the imperialists' claim that Siam was uncivilized and had to be colonized was unreasonable." This suggests that the Western form of these sciences may have saved Siam from actually being colonized by Western powers. Contrary to popular belief, King Mongkut did not offer a herd of war elephants to the US president Abraham Lincoln during the American Civil War for use against the Confederacy. He did, however, offer to send some domesticated elephants to US president James Buchanan, to use as beasts of burden and means of transportation. The royal letter of 14 February 1861, which was written even before the Civil War started, took some time to arrive in Washington DC, and by the time it reached its destination, President Buchanan was no longer in office. (Text of the royal letter here.) Lincoln, who succeeded Buchanan, is said to have been asked what the elephants could be used for, and in reply he said that he did not know, unless "they were used to stamp out the rebellion." However, in his reply dated 3 February 1862, Lincoln did not mention anything about the Civil War. The President merely politely declined to accept King Mongkut's proposal, explaining to the King that the American climate might not be suitable for elephants and that American steam engines could also be used as beasts of burden and means of transportation. A century later, during his state visit to the US, King Bhumibol of Thailand, who is Mongkut's great-grandson, referred to this event in his address before the US Congress on 29 June 1960. He said, "my great-grandfather offered to send the President and Congress elephants to be turned loose in the uncultivated land of America for breeding purposes. That offer was made with no other objective than to provide a friend with what he lacks, in the same spirit in which the American aid program is likewise offered." The asteroid 151834 Mongkut is named in honour of the King and his contributions to astronomy and the modernization of Siam. King Mongkut is one of people with the most children in Thai history, he had 32 wives and concubines during his lifetime who produced at least 82 children, one of whom was Chulalongkorn, who married four of his fathers daughters by other women. ^ 'King's Ears Won't Hear Songs From "King and I"', Washington Post (28 June 1960), pg. C1. ^ Marguerite Higgins, 'Siam King Found Shy And Welfare-Minded', Washington Post (30 August 1951), pg. B11. ^ Lawrence Meyer, 'Court And "The King"', Washington Post (21 November 1972), pg. B2. ^ Landon v. Twentieth Century-Fox Film Corp., 384 F. Supp. 450 (S.D.N.Y. 1974), in Donald E. Biederman, Edward P. Pierson, Martin E. Silfen, Janna Glasser, Law and Business of the Entertainment Industries, 5th edition (Westport, Connecticut: Greenwood, 2006), pp. 349–356. ^ 'Thailand bans "Anna and the King"', Asian Economic News (3 January 2000). Accessed 29 August 2008. ^ Glenn S. (August 12, 2013). "มงกุฎ" (Dictionary). Royal Institute Dictionary—1982. Thai-language.com. Retrieved 2013-08-12. มงกุฎ /มง-กุด [นาม] เครื่องสวมพระเศียรโดยเฉพาะพระเจ้าแผ่นดิน มียอดสูง. [วิเศษณ์] สูงสุด, ยอดเยี่ยม. ^ Bradley, William Lee (1969). "The Accession of King Mongkut (Notes)" (PDF free). Journal of the Siam Society. Siam Heritage Trust. JSS Vol. 57.1f (digital). Retrieved August 11, 2013. ...alluding ... to the two Chau Fa's. ^ a b c Bruce, Robert (1969). "King Mongkut of Siam and His Treaty with Britain" (PDF). Journal of the Royal Asiatic Society Hong Kong Branch. The University of Hong Kong Libraries Vol. 9. Retrieved 2011-06-27. ^ Tarling, Nicholas. The Cambridge History of Southeast Asia vol.1 part 1, 1999. p.44. 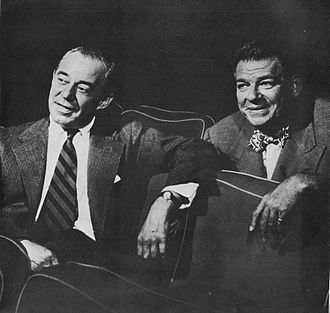 ^ Accordingly, the Hollywood depiction of the bare-chested Kralahome (prime minister) in Anna and the King of Siam (1946) and Yul Brynner's shirtless King Mongkut in The King and I (1956) are not only historically inaccurate, but considered by Thais to be offensive to the memory of the reformist monarch. ^ Rodriguez, Junius P. (1997). The historical encyclopedia of world slavery (2nd print. ed.). Santa Barbara, Calif.: ABC-CLIO. p. 631. ISBN 9780874368857. ^ "Slavery in Nineteenth Century Northern Thailand: Archival Anecdotes and Village Voices". Kyoto Review. 2006. Archived from the original on 2007-06-26. ^ Espenak, F. "NASA—Solar Eclipses of History". eclipse.gsfc.nasa.gov. ^ "Nontraditional Animals For Use by the American Military – Elephants". Newsletter. HistoryBuff.com. June 2011. Archived from the original on May 29, 2012. Retrieved May 29, 2012. Both original letters still exist today in archives. ^ "IAU Minor Planet Center". NASA. Retrieved 19 February 2015. ^ Christopher John Baker; Pasuk Phongpaichit (2009). A History of Thailand. Cambridge University Press. p. 31. ISBN 978-0-521-76768-2. Retrieved 2016-08-09. Constance Marilyn Wilson, State and Society in the Reign of King Mongkut, 1851–1868: Thailand on the Eve of Modernization, Ph. D. thesis, Cornell 1970, University Microfilms. B. J. Terwiel, A History of Modern Thailand 1767–1942, University of Queensland Press, Australia 1983. This contains some anecdotes not included in the other references. Stephen White, John Thomson: A Window to the Orient, University of New Mexico Press, United States. Thomson was a photographer and this book contains his pictures some of which provided the basis for the engravings (sometimes misidentified) in Anna Leonowens' books. There is reference to Mongkut in the introductory text. Winichakul, Thongchai. Siam Mapped: A History of the Geo-Body of a Nation. Various pages from Chapter 2. University of Hawaii Press (1997). Web. Wikimedia Commons has media related to Mongkut. The King's Thai: Entry to Thai Historical Data – Mongkut's Edicts maintained by Doug Cooper of Center for Research in Computational Linguistics, Bangkok; accessed 2008-07-11. Phetchaburi is a town in southern Thailand, capital of Phetchaburi Province. In Thai, Phetchaburi means city of diamonds and it is approximately 160 km south of Bangkok, at the northern end of the Thai peninsula. As of 2005, the town had a population of 26,181, the Phetchaburi River runs through the middle of the city. The region is flat, save for a single hill on the outskirts of town. The royal palace named Phra Nakhon Khiri and one of the many wats are on top of Khao Wang, the hill and town is the site of an annual festival, called the Phra Nakhon Khiri Fair. It lasts for eight days in early February and includes a sound and light show, the official city flower is the leelowadee flower or frangipani. Phetchaburi is known for its traditional Thai desserts, the most well-known is a custard dessert called khanom mor gaeng. Other popular desserts include Portuguese-influenced thong yip, thong yod, Phetchaburi has numerous private and public schools from K-12. Several have English programs taught by native English speakers to ready students for higher education, some of the well-known schools are Prommanusorn School, Benjamaputit Mattayom school. Phra Phutthayotfa Chulalok, born Thongduang and known as Rama I, was the founder and the first monarch of the reigning House of Chakri of Siam. His full title in Thai is Phra Bat Somdet Phra Paramoruracha Mahachakkriborommanat Phra Phutthayotfa Chulalok and he ascended the throne in 1782, after defeating a rebellion which had deposed King Taksin of Thonburi. He was celebrated as the founder of Rattanakosin as the new capital of the reunited kingdom, during this time he emerged as Siams most powerful military leader. Thongduang was the first Somdet Chao Phraya, the highest rank the nobility could attain, in 1782, he took control of Siam and crowned himself as the monarch. The most famous event in his reign was the Burmese-Siamese War of 1785, like other high-ranking figures of old Siam, Rama Is name changed several times during his lifetime, depending on his respective position, and even posthumously the way he was referred to change. His name at birth was Thongduang, family names had not yet introduced in Siam at that time. When Thongduang served as deputy governor of Ratchaburi Province during the rule of King Ekkathat of Ayutthaya, finally Taksin created him the title of Somdet Chaophraya Maha Kasatsuek, a noble title as high as no Siamese official had born before him, making him quasi-royalty. When he ascended to the throne in 1782, he took the name Ramathibodi and his full title was much longer, intended to demonstrate his universal claim to power like of earlier Siamese kings. After his death, the referred to him simply as Phaendin Ton. Continuing this system consequently, his grandson Rama III would have been the last reign and he demanded to refer to his two predecessors using the names of these Buddha statues. The one dedicated to the first Chakri king was named Phra Phutthayotfa Chulalok and this is how this king is still referred to in Thai history books. His descendant Vajiravudh who had studied in England, realised that most Siamese kings names were difficult to reproduce and he therefore disposed to use for all kings of the Chakri dynasty the name Rama together with the respective ordinal number. Phra Phutthaloetla Naphalai or Rama II was the second monarch of Siam under the House of Chakri, ruling from 1809 to 1824. In 1809, Itsarasunthon succeeded his father Rama I, the founder of Chakri dynasty and his reign was largely peaceful, devoid of major conflicts. His reign was known as the Golden Age of Rattanakosin Literature as Loetlanaphalai was patron to a number of poets in his court, the most notable poet in his employ was the illustrious Sunthorn Phu, the author of Phra Aphai Mani. Chim was born in 1767 during the in Amphoe Amphawa, Samut Songkram, Chim was a son of Luang Yokkrabat of Ratchaburi and Nak of Samut Sakorn, as his father and mother was known. They would become King Rama I and Queen Amarindra, respectively, in 1767, Ayutthaya fell to Burmese invaders. His father, Phraya Ratchaburi, joined Phraya Wachira Prakarns forces to recapture the city, under King Taksin, Chims father rose rapidly to high rank as a military leader and was assigned with the campaigns to subjugate Laos and Cambodia. In 1782, his father crowned himself King of Siam and Chim himself was raised to the title of Prince Itsarasunthon of Siam, with his concubine Chao Chom Manda Riam, fathered Prince Tub in 1787. Prince Itsarasunthon had an affair with his own cousin. In 1801, Rama I found out that Princess Bunrod had been pregnant for four months, however begged his father to forgive him and the princess was reinstated and became his consort through the negotiation by Concubine Waen. Unfortunately, the baby died just after its birth, with Princess Bunrod, Loetlanaphalai fathered Prince Mongkut and Prince Chutamani. As the eldest surviving son of Rama I, Prince Itsarasunthon succeeded to throne when Buddha Yotfa Chulaloke died in 1809. No royal naming system was established at the time Rama II was crowned and he was named by his son Nangklao as Loetlanaphalai and by the Rama convention, called Rama II. His consort, Princess Bunrod, was raised to Queen Sri Suriyendra, as soon as Loetlanaphalai ascended the throne, Prince Kshatranichit, the surviving son of Taksin, rebelled as pretender to the throne. Wat Pavaranivesh Vihara Rajavaravihara is a major Buddhist temple in Phra Nakhon district, Thailand. The temple is a center of the Thammayut Nikaya order of Thai Theravada Buddhism, it is the shrine-hall of Phra Phuttha Chinnasi, Bowonniwet has been a major temple of patronage for the ruling Chakri dynasty. It is where many royal princes and kings studied and served their monkhood, including King Bhumibol and his son, the golden chedi at the wats shrine carries the relics and ashes of Thai royals. 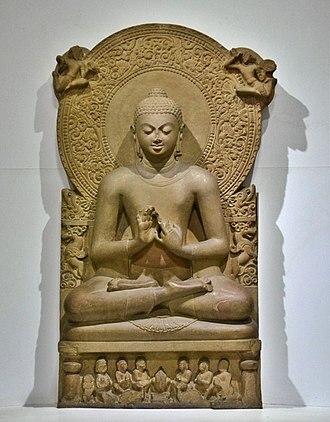 The two viharas are closed to public, the T-shaped bot holds a magnificent Sukhothai-period Buddha, cast in 1257 CE to celebrate freedom from the Khmers. The murals on the interior walls were traditionally light and limited in their subject matter. They were painted to appear three-dimensional, monk artist Khrua In Khong introduced Western style in the murals depicting Buddhist subjects. In 1836, Prince Bhikkhu Mongkut arrived at the temple and became its first abbot and he stayed at the temple for 27 years before acceding the throne of Siam as King Rama IV. Naresuan or Sanphet II was the King of the Ayutthaya Kingdom from 1590 and overlord of Lan Na from 1602 until his death in 1605. Naresuan is one of Thailands most revered monarchs as he is known for his campaigns to free Ayutthaya from the vassalage of the Taungoo Empire, during his reign, numerous wars were fought against Taungoo Burma. Prince Naret was born in Phitsanulok in 1555/56 and he was the son of King Mahathammarachathirat of Phitsanulok and his queen consort, Wisutkasat. His mother was a daughter of Maha Chakkraphat and queen consort Suriyothai and his father was a Sukhothai noble who had defeated Worawongsathirat in 1548 and put Maha Chakkraphat on the throne. Prince Naret, known as the Black Prince, had a younger brother Ekathotsarot, known as the White Prince, and an elder sister, Suphankanlaya. 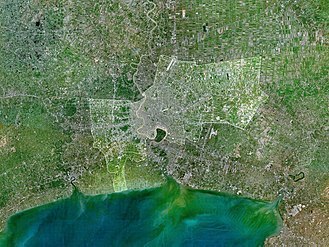 Maha Thammarachathirat came to believe that the city would not be able to withstand a long siege due to a scarcity of food, King Bayinnaung took Phitsanulok and Ayutthaya, and made Siam a Burmese tributary state. He required Maha Thammarachathirat to send his son—the Black Prince—to Bago as a hostage to ensure the kings fidelity, in 1569, Bayinnaung put down the Siamese rebellion that had begun a year earlier, and installed Maha Thammarachathirat as a vassal king of Ayutthaya. After six years in Pegu, c,1570, Prince Naret and his brother the White Prince returned to Ayutthaya. While in Burma, he followed the best of Burmese military training, studying alongside the elite of Burmese youth, besides being gifted in military prowess, Naresuan who was highly intelligent, gained a great deal of general knowledge of the times. Maha Thammarachathirat made Naret the Uparaja of Phitsanulok as Naresuan at the age of 15, Naresuan joined his father and the King of Bago in an expedition to conquer Vientiane, the capital of the restored Lan Xang, but he contracted smallpox and had to return. He built Chankasem Palace in Ayutthaya as a residence when he visited his parents, in 1581, Bayinnaung died, and was succeeded by his son Nanda Bayin. The Grand Palace is a complex of buildings at the heart of Bangkok, Thailand. The palace has been the residence of the Kings of Siam since 1782. The king, his court and his government were based on the grounds of the palace until 1925. King Bhumibol Adulyadej, resided at Chitralada Royal Villa in the Dusit Palace, several royal ceremonies and state functions are held within the walls of the palace every year. The palace is one of the most popular tourist attractions in Thailand, construction of the palace began on May 6,1782, at the order of King Phutthayotfa Chulalok, the founder of the Chakri Dynasty, when he moved the capital city from Thonburi to Bangkok. Throughout successive reigns, many new buildings and structures were added, by 1925, the king, the Royal Family and the government were no longer permanently settled at the palace, and had moved to other residences. After the abolition of monarchy in 1932, all government agencies completely moved out of the palace. In shape, the complex is roughly rectangular and has a combined area of 218,400 square metres. It is situated on the banks of the Chao Phraya River at the heart of the Rattanakosin Island, today in the Phra Nakhon District. The Grand Palace is bordered by Sanam Luang and Na Phra Lan Road to the north, Maharaj Road to the west, Sanamchai Road to the east and Thai Wang Road to the south. 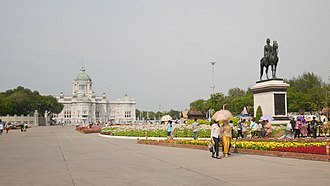 Rather than being a structure, the Grand Palace is made up of numerous buildings, pavilions set around open lawns, gardens. Its asymmetry and eclectic styles are due to its development, with additions. The Grand Palace is currently open to the public as a museum. The construction of the Grand Palace began on 6 April 1782, having seized the crown from King Taksin of Thonburi, King Rama I was intent on building a capital city for his new Chakri Dynasty. 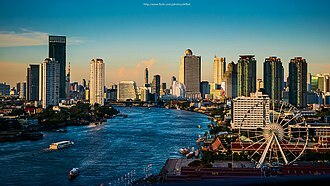 He decided to move the seat of power from the city of Thonburi, on the west side of the Chao Phraya river, the new capital city was turned into an artificial island when canals were dug along the east side. The island was given the name Rattanakosin, the previous royal residence was the Derm Palace, constructed for King Taksin in 1768. 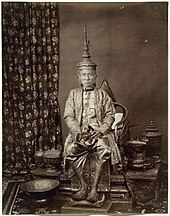 Nangklao or Rama III was the third monarch of Siam under the House of Chakri, ruling from 21 July 1824 to 2 April 1851. He succeeded his father, Rama II, as the King of Siam and his succession was unusual according to the traditions because Nangklao was a son of a concubine rather than a queen. His accession was perceived by observers as having usurped the prior claim of Prince Mongkut. Under the old concept of Thai monarchy, however, a king must emulate Maha Sammata in that he must be elected by the people. Ironically, Prince Mongkut may have contributed to this misconception. During Nangklaos reign, the hegemony of Siam was established by putting down the Laotian Rebellion, the Siamese–Vietnamese War. King Nangklao was born as Prince Thap in 1788 to Prince Isarasundhorn and one of his royal wives Chao Chom Manda Riam, following Isarasundhorns coronation in 1809, Prince Kshatriyanuchit, the surviving son of Taksin, revolted as pretender to the throne. Prince Thap was assigned to suppress the rebellion, temples he had constructed were characterized by Chinese influence. As the Prince was administrating trade affairs, his half-brother Prince Mongkut pursued the way of religion, in that year, Phutthaloetla Naphalai died suddenly without having named a successor to vice king Maha Senanurak, who had died July 16,1817. According to the traditions of succession, the vice king or uparaja was heir presumptive. If there were none, an ad hoc senabodi consisting of senior officials present at the death of a king, foreign observers accustomed to the concept of an heir apparent expected Prince Mongkut, as the a son of the queen, to succeed the throne. However, the assembled Senabodi considered Prince Chetsadabodin a more competent choice as he had served the king in Kromma Tha for years. 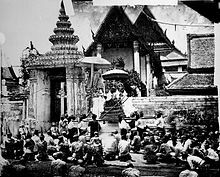 Support came strongly from high-ranking nobility, including Chao Phraya Abhay Pudhorn, the Samuha Nayok, and Dis Bunnag Minister of Kromma Tha, Chetsadabodin accepted the throne and was crowned in 1824. He raised his mother, Riam, to Princess Mother Sri Suralai and he appointed his uncle Sakdiphonlasep as vice king on July 21,1824 – who predeceased the king May 1,1832, leading to yet another succession crisis. The office-holder was considered second only to the King, and the heir presumptive. The office is referred to in English as Vice King. It originated in the Ayutthaya period and gained significant powers during the Rattanakosin period, Front Palace occupants were usually a son or brother of the reigning monarch. The office existed until the death of the last occupant, Prince Vichaichan, King Chulalongkorn abolished the office of an heir presumptive, introducing in its stead the Western concept of a crown prince as heir apparent, and styled the new office Crown Prince of Siam. The Uparaja or Uparat concept of a Viceroy was of Greater Indian origin, in 1448, Sukhothai King Trailokanat was crowned as the king of Ayutthaya, uniting the two kingdoms. During the 15th century, the Kingdom of Sukhothai, which centered on Pitsanulok, served as the seat of most of Uparats, as they were, with few exceptions, king of Sukhothai. After the first fall of Ayutthaya in 1569, Maha Thammaracha crowned his son Naresuan as Uparat, Naresuan had a palace built in front of his Royal Palace, to be his sons place of residence when visiting Ayutthaya - thereby giving rise to the name Front Palace. In 1583, Naresuan annexed the Sukhothai kingdom to Ayutthaya, after his coronation, Naresuan appointed his brother Ekathotsarot to be the Uparat, stating that his brother in the Front Palace had equal status to the King in the Royal Palace. Phetracha in 1688 appointed his son Luang Sorasak as the Uparat living at the Front Palace, for the first time the descriptive term used was Krom Phrarajawang Bovorn Sathan Mongkol. The Uparat was usually the brother of the king, and only heir presumptive to the throne, when the Uparat died before the king, the title often remained vacant for several years, until the King deigns to appoint a new vice-king. With the foundation of the Chakri dynasty in 1782, Phutthayotfa Chulalok made his younger brother Bunma the Front Palace, Maha Sura Singhanat supervised the construction of Front Palace in Bangkok. Later Front Palaces continued the expansion of the palace, Prince Isarasundhorn was the only Front Palace who did not reside in the Front Palace but instead lived at the Thonburi Palace. Ironically, with the exception of Prince Isarasundhorn, none of the Rattanakosin Front Palaces were actually crowned as they were mostly the monarchs siblings. During this time the Vice-King resided in the Front Palace north of the Grand Palace, the Front Palaces during the Rattanakosin period wielded great power, with their own private army and even a navy. In 1851, King Mongkut made his brother Pinklao the Front Palace and crowned him as a King equal in rank to himself, as was the case of Naresuan and Ekatotsarot. Pinklao received all the styles and titles usually reserved only for the monarch, in 1868, after the coronation of young Chulalongkorn, Sri Suriyawongse his regent arranged the grant of the title of Front Palace to Pinklaos son Prince Yingyot, as Front Palace Bovorn Vichaichan. Though the office had been superseded, Mahidol Adulyadej, the Prince Father was posthumously given an equivalent rank, the crisis started due to the fast-paced reforms started by the young King Chulalongkorn. 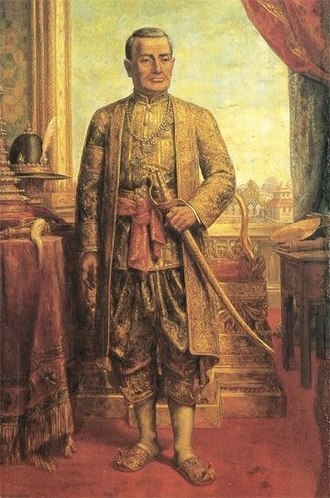 Thongduang, later King Rama I of Siam, founded the Chakri dynasty in 1782. King Prajadhipok signing the Constitution of Siam, 10 December 1932. 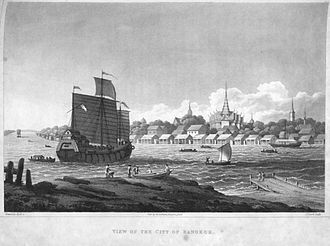 View of the city of Bangkok in 1822. Royal statue of King Naresuan at Phra Nakhon Si Ayutthaya. Elephant battle between Naresuan and Mingyi Swa as wall murals in Phra Ubosot, Wat Suwan Dararam, Ayutthaya, Thailand. King Naresuan entered Bago near Shwemawdaw Pagoda. Samdech Preah Sanghareach Bour Kry, the current Supreme Patriarch of the Dhammayuttika order of Cambodia. Wat Phra Kaew seen from the Outer Court of Grand Palace. The Temple of the Emerald Buddha, one of the king's many construction projects. Hanuman on his chariot, a mural scene from the Ramakien in Wat Phra Kaew. The Mahamuni Buddha image in Mandalay is crowned with a crested magaik bejewelled with diamonds, rubies and sapphires. The Front Palace or Wang Na (circa 1890) now the Bangkok National Museum. The Royal Thai Navy headquarters building, originally built for the Royal Thai Naval Academy and later modified with a Thai-style roof, sits on the grounds of the former palace.